North Carolina residents and emergency managers began preparing for Hurricane Irene August 24 as the Category 3 storm approached the state with 115 mph sustained winds. Effects from the hurricane could be felt in New Hanover County by the evening of August 26. By the time Hurricane Irene made landfall at 9 a.m Saturday, Aug. 27 near Cape Lookout the winds had diminished and was downgraded to a Category 1 storm. The hurricane caused storm surge of 2 to 4 feet along parts of the Outer Banks and up to 15 feet along parts of the Pamlico Sound. More than 270 roads and 21 bridges closed due to flooding, debris and damage (at peak). 196 - number of temporary housing units provided by FEMA as temporary shelter for 194 families in remote areas as they rebuilt their homes. 1,814 - number of Public Assistance projects for which funds have been obligated. 323 different agencies applied for funding assistance. 900 - number of properties analyzed for potential hazard mitigation funding. Gov. Perdue requested a pre-landfall federal Emergency Declaration August 24. President Obama approved a federal emergency declaration for 16 counties on August 25; 18 more counties were added on August 28. The counties are: Beaufort, Bertie, Brunswick, Camden, Carteret, Chowan, Columbus, Craven, Currituck, Dare, Duplin, Edgecombe, Halifax, Hyde, Gates, Greene, Hertford, Johnston, Jones, Lenoir, Martin, New Hanover, Nash, Northampton, Onslow, Pamlico, Pasquotank, Pender. The declaration enables local governments to seek federal financial assistance to help cover the costs of emergency protective measures. Aug. 31 - President Obama approved the IA disaster declaration for the 7 counties to provide individuals with low-interest loans and other assistance to help hurricane survivors recover. Gov. Perdue requests Halifax and Lenoir be added to the IA declaration. Sept.1- Halifax and Lenoir counties receive declaration for individual assistance. Gov. requests Currituck, Pitt, Onslow and Washington counties be added to IA declaration. President Obama approves the public assistance disaster declaration for 20 counties (Beaufort, Brunswick, Carteret, Chowan, Columbus, Craven, Dare, Duplin, Edgecombe, Halifax, Hyde, Jones, Lenoir, Martin, Nash, Onslow, Pamlico, Pender, Tyrrell and Wilson) to help local governments recoup costs for storm response, debris removal and infrastructure damage. Sept. 2 - Currituck, Pitt, Onslow and Washington counties are added to IA declaration. Sept. 3 - Greene, Jones, Nash, Warren and Wilson counties added to IA declaration. Bertie, Camden, Currituck, Green, New Hanover, Pasquotank, Perquimans, Pitt and Wayne approved for PA(29 total). Sept. 4 - Bertie, Brunswick, Camden, Chowan, Duplin, Edgecombe, Gates, Hertford, Johnston, Martin, New Hanover, Northampton, Pasquotank, Perquimans and Vance added to IA declaration (33 counties total). For more information on how to prepare for hurricanes, please see the links on our Hurricanes page and please visit ReadyNC.org for additional information. 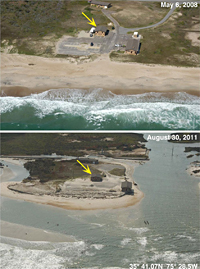 Aerial photos of Pea Island National Wildlife Refuge, NC, from May 6, 2008 (top, pre-storm) and August 30, 2011 (lower, post-storm). The yellow arrow in each image of the lower images points to the same structure. At this location, two breaches were carved through the island, severing NC Highway 12. With the storm surge higher on the island's sound-side, currents flowing from sound to ocean may have contributed to creating these breaches.